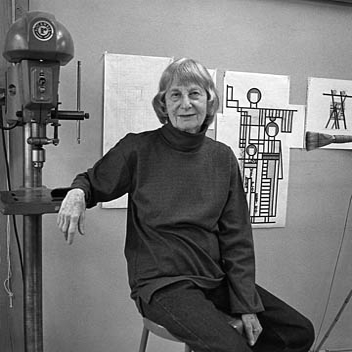 Amalie Rothschild (1916-2001) was a painter, sculptor and printmaker who lived and worked her entire life in Baltimore, Maryland and made enormous contributions to the cultural and artistic environment of the city and local area. She is best known as an abstract, geometric painter and sculptor working in materials including plexiglas, aluminum, bronze, bark, handmade cast paper, and particle board, as well as oil and acrylic, watercolor and drawing. Her work, despite its abstract geometric appearance, was frequently self-referential and often dealt with the issues of balancing the duties of wife and mother with the strivings of the artist, while at the same time paying homage to historical themes. During the 1960s Rothschild broke out from her often hard-edged geometric paintings into sculpture and created more than 325 works, from large outdoor and sometimes monumental pieces, to elegant, table-top scale spatial explorations of balance that explored the contrast between the solid and the void, to linear pieces that have been described as "drawing in space." Beginning in the feminist 1970's Amalie Rothschild created her most innovative work, a series she referred to as Vestments. Constructed of sculptural materials, including aluminum and translucent plexiglas which simulate colorful evocations of stained glass, as well as cord and handmade chain links, the non-wearable forms are designed to hang and be seen from front and back, more in the manner of textiles than sculptures. In addition, throughout her life she drew almost every day, creating hundreds of works on paper. When she died she left a vast oeuvre comprising approximately 1400 fully realized works in all media, some 270 of which are in private collections and museums.